Piedmont Animal Health is fortunate to work with directors who have decades of experience in biomedical research and development, financing and investment, corporation management and pharmaceutical science. Lanty Smith is the founder, Chairman and CEO of Tippet Capital, an investment and merchant banking firm headquartered in Raleigh, NC. Smith is Vice Chairman of the Board of Directors of Duke Management Company, which manages Duke University’s endowment and other funds. He is a founder and chairman of Precision Fabrics Group, Scion NeuroStim and MediWave Star Technology. Smith served in a number of board positions with Wachovia Corporation including Chairman of the Board and Acting Chief Executive Officer. He was President of Burlington Industries from 1986-1988 after joining in 1977 as Executive Vice President and Senior General Counsel. He was a Partner in the international law firm Jones Day. 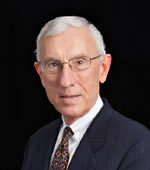 Smith is a former Trustee of Duke University and continues to be involved in various activities at the University and in North Carolina.